Welcome to the “Becoming Your Best Global Leadership” podcast series. This is Steve Shallenberger, your host. This is the final installment of seven podcasts on the Transformation Challenge. Rob introduced the Transformation Challenge, what it is, and then each one of us have gone from Step One all the way through now to Step Six. Step One, we shift as leaders. Whatever the problem is, this weighted down thing, which might carry emotion and sometimes cross feelings and a lot of stress. You might feel overwhelmed, too? Well, what is the vision? What are we trying to accomplish? Step Two is what’s the current reality? So we see if there’s a gap between the vision we have and the current reality. And if so, then we move through the Six Steps. The third step is critical. It is what is the real cause for the gap? Once we understand the real cause by asking why, why, why, and digging deeper. Deeper so that we have the right issue, we move on to Step Four, which is what are the best options? Oh, this is such a great step that invites us to use our imagination and creativity to come up with ideas, and it’s fun! You can do this both yourself and your team, brainstorming, utilizing mind mapping. Then we asked the question, go or no go? If the answer is a go, we move to Step Five. Step Five is to do it, and especially who will do what, when? It’s to put forth a plan of our best shot at solving this problem. Of resolving the gap and getting to a better place. That brings us then to Step Six, to debrief and evaluate the results. That then ties back into Step One. Did we solve it? Did we realize our vision? Is that the outcome? Here’s a couple more. “I’m not convinced that it would be useful to do an evaluation.” Here’s another one, “It’s a trap,” or, “Think of all the hassle that it would cause.” Or here’s another one, “It’s impossible to do it with the necessary objectivity.” I love it. Here’s the final four. “Well, we don’t have all the data, so we can’t debrief and evaluate.” Or a couple more, “The project document is too vague.” Okay, whatever. “It’s a national holiday,” or, “It’s the rainy season.” All right. Well, I get it. Well, that’s fun as we think about that. But as we dive in really to this Step Six, it’s a wonderful, powerful step. And the entire process of the Six-Step process is to improve. It offers a reliable, powerful way to engineer better results. To solve problems, and to develop opportunities. It helps you to address the most important issues in your life. Those that affect your happiness, your peace, productivity, and the success of your organization. The Six Steps empowers you to lead your life, your family, and your team. These steps arm you with a repeatable process. A standard operating procedure to navigate change and to transform your results. In your organization, you can fuse, pull together, permanently make stronger the Six-Step process into your culture. So remember, you will either have a culture by design or you will have a culture by default. And it is much easier to establish a culture when founded on solid processes so that people aren’t left guessing what is the right way to move forward. Well, by this point, if you’ve navigated the first five steps of the process, you’ve come a long way from your starting point. 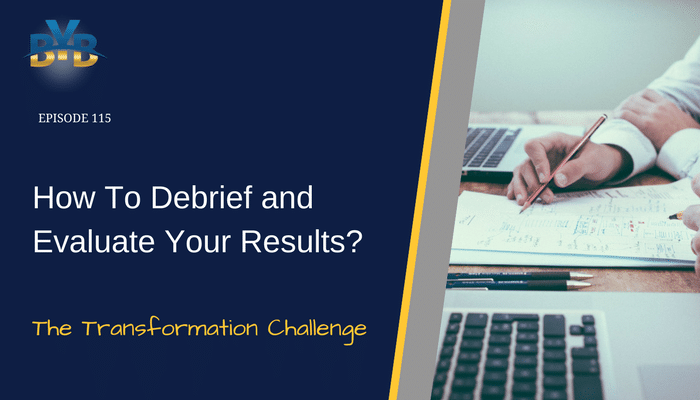 And now in step six, you get a chance to step back, to debrief and evaluate your results. And the debrief is all about the pivot and course corrections. You identify what’s working well and what’s not working and then develop lessons learned to repeat the successes and eliminate the failures. So, step six doesn’t just happen after your who, what, when. In other words, step five, to implement, you should build in a debrief and evaluation dates right into the who, what, when plan as well as have a debrief after the plan is complete. In other words, this is all part of it. You write it in right now. In other words, during the execution of your plan, you should pause to assess your progress and ask whether you’re on track and if you are great, and if you’re not, what adjustments need to be made to course correct. And after you’ve finished executing your plan, the who, what, when, you pause again to debrief your results. Did you get the results you wanted, and did you accomplish the vision? If so, great. Results you wanted, you know, are right on track. And so this is why we apply the six steps. You can now take it and apply it to another issue, another opportunity. On the other hand, if not, what are the lessons learned so that you can repeat the process, the successes you’ve had, and then eliminate any failures as you go back to step one and reassess the vision. This is the reason that the illustration of the six-step process shows it flowing in a continuous circle, because we use it over and over and over. And what might happen is you might partially solve the problem, you might partially develop the opportunity but didn’t get there all the way. Well, then you keep using the six steps until you ultimately realize your vision. So that’s really the idea. And remember, the debrief is what makes fighter pilots so good at what they do. As Rob explained and our other son has explained to me many times, after every flight, every sortie, the pilots will take between one to eight hours to debrief. And the debrief is nameless and rankless, which removes ego and keeps everybody focused on what’s right, not who’s right. And so the debrief has one primary objective, and that is to identify the root cause for the successes and failures so that successes can be repeated in future flights and failures can be minimized or eliminated. So step six is the debrief zone. And look at this step as if you were a fighter pilot. As we already mentioned, it is important for you to include debrief or evaluation dates in your who, what, and when plan. And these are built-in pause buttons where you assess your progress, for example, that might say right in the middle of your plan, who? Well, Jim will do it. What? Marketing team mid-course debrief to assess your progress. When? April 1st. So this practice of debriefing really inoculates us against the tendency to blitz from project to project in a mad dash. And when most people or teams finish a project, they high-five each other, pat themselves on the back, and then just move on to the next project. They never really pause to identify the lessons that can be applied in the future. And so while it seems counterintuitive to slow down, it’s a huge boost for your productivity. Why? Well, while your body may be taking a break from task, your brain shifts into high analytical gear to evaluate and learn from what just happened. So remember, in step five, just before you created the who, what, when, you were invited to review lessons learned. Those lessons learned typically come from two places, other people who have experienced a similar challenge or lessons that you learn from a debrief. So, with that in mind, here are a few debriefing questions that may be helpful. So, number one, were your vision and goals clearly articulated? Okay, that’s a really good one. Number two, did you fully capture the current reality, both positive and challenging aspects of the issue? And that’s important to do, this take stock of the positive assets that you have in place to help solve it. Number three is did you ask why, why, why, and really get to the real root cause of the issue causing the gap between the current reality and the vision? Here’s another really good debrief question. Did you create an environment within your team where the best ideas could come forward to provide the basis for a strong plan of action to solve the problem or develop the opportunity? A fifth one for step five is did you set up a plan of action based on best ideas, including who would do what by when? And then was the plan communicated to all key stakeholders to maximize your chance for success? And did you have a red team review the plan and offer suggestions in what worked well and what didn’t work so well in this process and why? And then last of all, did you pause to debrief and evaluate the results during the execution of the plan? And what lessons learned did you identify? Then how could you have improved? So this powerful step is often one of the most overlooked, yet it can be one of the most important. And this is particularly true when dealing with complex or ongoing issues, such as a manufacturing issue, a sales issue, improving a relationship, or having better health. Well, okay, as we go into the stretch of this podcast, let’s look again, come back to a couple of our case studies that we’ve been talking about. One of those is Flying J. And so Crystal and her team immediately went to work on the action items as part of their plan to save the company. They debriefed several times during the execution of the plan. They made necessary adjustments and pivots to the plan to stay on track. Well, what was the ultimate result? Flying J came out of bankruptcy 18 months later after satisfying 100% of their obligations. And after emerging from Chapter 11, they were poised to be a dominant force in the industry. They ended up selling and merging their Flying J travel centers with Pilot travel centers while retaining their other operations under the new FJ Management company. This merger with an incredible partner allowed the new group of travel centers to be the predominant travel center company throughout the United States. And the refinery and pipeline were sold, providing much-needed capital while allowing Crystal and her team with her husband, Chuck, to focus on the business units that had the greatest profit potential. The company was saved, yay, and FJ Management was well-positioned to be one of the premier companies in their industry, which was a part of Crystal’s new vision. Both Crystal and her team had accomplished the seemingly impossible of saving their company. They achieved a stronger position than ever before. And at the time of this podcast, and as they’ve been moving forward, it’s been six years since the company was saved and reorganized, almost seven. And FJ Management has successfully branched into another vertical and is thriving, and they have launched a new line of convenience stores named Maverik. And they are dominating in almost every geographical region where they’re located. So, way to go. This is a great example. First of all, congratulations to Crystal, Chuck, and their team, but this is a great example of applying the principles of the six-step process of transformation, a great job and a wonderful example to us. Now onto the last of our case studies that I’m gonna use, and it’s back to Shawn in the 18 months of unemployment. Shawn did fully implement his plan of who, what, and when. He revised his resume. He shaved and looked sharp. He went to my house on Saturday. We role-played the interview that he would have on Monday. It was actually fun. We went over it and over it. The primary focus of the role play was for Shawn’s vision and the difference that he can make in the organization that he was interviewing with. He actually took the time to visualize and practice the tough questions he knew that would come, questions about his background, his experience in the last 18 months. Together, we practiced his answers over and over, not until he got them right, but until he couldn’t get them wrong. And Shawn was ready for the interview on Monday. Emotionally, physically, and mentally, he was excited. The interview on Monday was scheduled with a premier software company. It went amazingly well just as planned, and they asked about his bachelor’s of life. And Shawn explained that because of his experience in the marketing world, he had indeed obtained far more than a diploma. He had a bachelor’s of life because of his experience. So this certainly piqued the interest of the interviewers, and everyone was engaged and wanted to know more about Shawn. So this question about his bachelor’s used to be an obstacle. Now, he really turned it into an opportunity. The interviewer then asked Shawn, “Well, what was your vision?” and how did he feel about what he can contribute. Well, thanks to our role-playing and the work that Shawn had done that question was right in his wheelhouse. He had practiced answering it numerous times. He was prepared, and confident, and calm, and he shared his vision and then added that part of his vision was to help them sleep well at night. I mean to tell you, they loved it. Well, they invited Shawn back on Tuesday for a follow-up interview. And during the interview, they had additional people in the room as well as the executives who were there from the first interview. And the executives from the first interview asked Shawn to repeat the part about helping the owners sleep well at night and how he would do that. Again, he was ready, and everybody in the room loved his answer that he’d practiced over and over, but it just flowed naturally and really did come from his heart. Shawn was invited back yet for a third interview with the key decision-makers where a job offer was made. The salary they offered was significantly higher than Shawn expected and included full benefits. Shawn accepted, and the long draining 18 months of unemployment were over. He became fully engaged in the workforce. And in the ensuing years with that company, Shawn’s done such a great job. He has helped them in one place or another. He helped them to sleep well at night, which resulted in several awards. He’s been promoted several times, and he really made an extraordinary contribution in that company with being one of the key managers and employees. So by taking the transformation challenge during a 5k walk, Shawn took a situation where he felt hopeless and within a few days landed a high-paying job. And because of this experience and his transformation, he and his family have really never been happier. They’ve done such a great job. Maybe Shawn will have an experience like this again in the future where he’ll need to apply the six steps, but this experience will help him learn and continue to grow. This is the way it is. You and I, each one of us, in our various responsibilities, day in and day out, will encounter countless types of challenges that will come our way. Now, we step forward and we take the challenge. It’s the Transformation Challenge. It’s deep down in the gut to do something about it. And we’re not afraid to shy…we won’t shy away. We’re not afraid to take this thing head-on with some confidence, with humility, with direction and a clear process of how to move ahead. I agree with this person that once said a number one guide to problem-solving in the world. And as a leader, it’s something that we can put in our toolkit to use over and over, but not just us. We can teach all of those within our life to also learn these principles, to take the Transformation Challenge themselves, to become proficient in the Six Steps. Well, that is a great transformation! We wish the best to each one of you. You literally are making a difference in people’s lives every day. This skill, this process will help us do so even more. We wish you the very best in it. We congratulate you for your energy, and your efforts, and your perspective. Not only do we use this process as we look at the external environment and see things coming in, but we can use the 12 Principles of Highly Successful Leaders to give us a framework to respond with confidence. Then we apply this process over and over and over to change the external environment and take the good to make it better and the better to make it best. This is Steve Shallenberger with Becoming Your Best Global Leadership wishing you a great day!